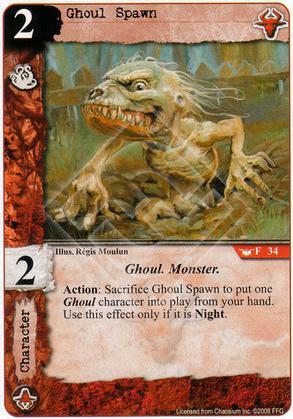 The stats are underwhelming on this surprisingly-adorable Ghoul, but thankfully his ability is pretty synergistic with the fact that a Ghoul deck will want it to be Night pretty much all the time. Unfortunately, there aren't a ton of Ghouls that cost so much that his effect is worthwhile. The only two that cost more than 3 are Richard Upton Pickman and Feasting Ghouls, both of which are somewhat underwhelming. Maybe someday the Spawn's day will come, but it will take printing an expensive and super awesome Ghoul to do it. Night restriction isn't too big a problem since Ghouls want this anyway. I also think to make the effect worthwhile you don't need the incoming Ghoul to be expensive, just to have more icons for a surprise boost in defense. Mallochio seems a good pick for example, and Shuggob can really get you out of jail if the opponent just played a day card. Needs a couple more Ghouls (shub box?) to help for sure, potentially very strong. I like the little fella, he is the worst of the ghoul characters for icons and skill but opponent cannot underestimate him because he can be swapped out or a much nastier character. It's been confirmed that more ghouls are in the next box so he will only get better.